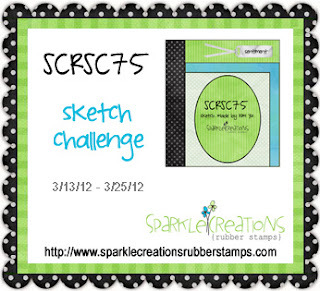 I also want to mention that this week, we are sponsoring Card Patterns Sketch 157. Since this week's SCRS challenge is a sketch challenge, I wasn't able to combine the challenges. For more information and for a chance to win Suitcase Ruby and Traveling Josh, please visit the Card Patterns site, HERE. I used Bicycle Chloe on my card today. I was in need of another teacher birthday card (which makes me caught up through the end of March... yay!). 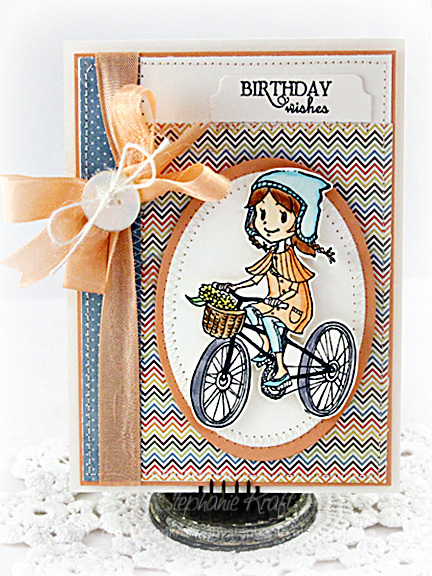 Accessories: Classic Oval Nestabilities - SM and LG (Spellbinders), Die-namics Mini Tabs Foursome (My Favorite Things), Markers (Copic), Seam binding, Thread, Twine (May Arts), Foam tape, Thread, Sewing machine. Adorabel card Stephanie! Love the sweet basket full of pretty flowers!